Biomass alongside wood and charcoal is a fuel option for the Zoom Versa named for its versatile performance. In reality biomass includes a wide range of materials that can be burnt to cook food. Of the 3 billion people without access to modern fuels maybe 60% use biomass to cook and these people exist at the poorer end of that spectrum. Biomass itself is often gathered from local environments thus depriving the area of organic compost. In turn this will contribute to soil loss, erosion and poor harvests. Ecozoom rocket stoves are fuel efficient cookstoves that can give fuel savings of 60% over a regular three stone or unimproved fire. Smokey emissions can be down 70% - reducing indoor air pollution and preventing respiratory health problems. These savings can make a big difference since family members can spend less time gathering biomass. The children who often carry out this activity might spend more time at their studies, or be exposed to less danger from wild animals or slavers. 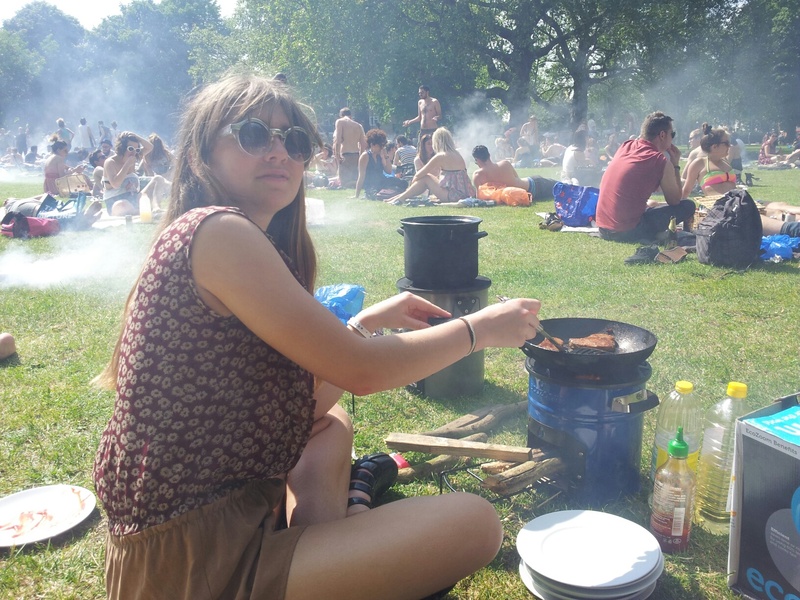 Out here in the UK things are a bit different and Zoom stove users mainly burn wood and charcoal when camping out or for real fire cooking on the patio at home. We wanted to see for ourselves how a Zoom Versa handled biomass so we set up a mini science study last weekend for a try out. In the line of fire were three types of biomass: pine cones; corn husks and dry animal droppings. OK I was a little apprehensive about the third, but as a fuel its the real deal for developing world cooks. This was from wild Exmoor ponies, with no odour and basically just straw, so gourmet biomass, so to speak. A hot fire is the key to rocket stove efficiency - trapping and burning up the smoke before it gets in your eyes. Having set up our test stove at a local park barbecue spot we warmed up the combustion chamber using wood. Then we tried each fuel in turn timing how long it took to boil one litre of water. 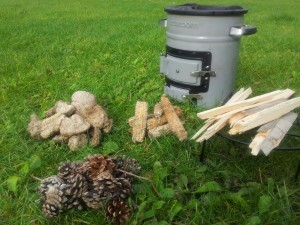 The cookstove gobbled up the fuel and there was very little ash left in the stove, its clear that biomass is a serious option for a Zoom Versa rocket stove and a fun experience. It was a pleasure learning about these fuel types and we got an idea of how people in the developing world might be cooking right now. We didn't check how these fuels might work in an open fire as this would be too smoky - even for a London barbecue place. I’ll be collecting pine cones for this purpose in future; corn husks - why not? ; pony power?..... lets face it, you can efficiently burn any dry biomass in a Zoom Versa. Unlike bottled gas or smokey barbies, your fuel is abundant and its everywhere.